Last year, I invested quite a bit into my self-care routine. Specifically, I made it a mission to experience various treatments such as regular massages, floatation tanks, and the infrared sauna. It became an addiction. Namely because of the high level of sensory stimulation one receives during these spa experiences. The other day, I went for a facial. And once again, I was hit with that sense of well being the moment I entered the private space. Immediately I asked myself, "why can't I recreate this type of feeling at home?" The more I thought about it, the more I realized that I needed to immediately start with the bathroom. Think about it, the bathroom is the first room you'll enter when you start your morning. And, if you keep up with your water consumption, you probably visit your bathroom countless times a day. My bathroom is tiny and uninspiring, but that doesn't mean that I can't incorporate elements of the spa life in my everyday experience. With just a few minor adjustments, I can have a bathroom that lifts my mood every time I step in. The first course of action is to make sure the bathroom is spotless. When the cleaning lady used to come on a regular basis, I never had to worry. But now I have to put in a little bit of effort. I use to put off bathroom cleaning duties until Saturday, but I realized that it's much easier if I clean throughout the week. That way, I'm tidying up an already clean room versus having to spend extra time getting it back up to standard. Once clean, I want to add various touches that are reminiscent of the spa experience. First on that list is a visually pleasing candle. I absolutely love inhaling a fresh scent every time I walk into a room. In order to balance costs, I'll sometimes alternate between a fancy candle and an oil burner. Next, I'm considering placing a few mists in the room (1.) a Facial Mist to keep my skin hydrated for the winter (2.) a Room Mist to use in lieu of a candle (3.) a Coconut Oil Mist to hydrate cuticles after washing my hands or to mist on the skin post shower and (4.) a light, fresh personal fragrance. 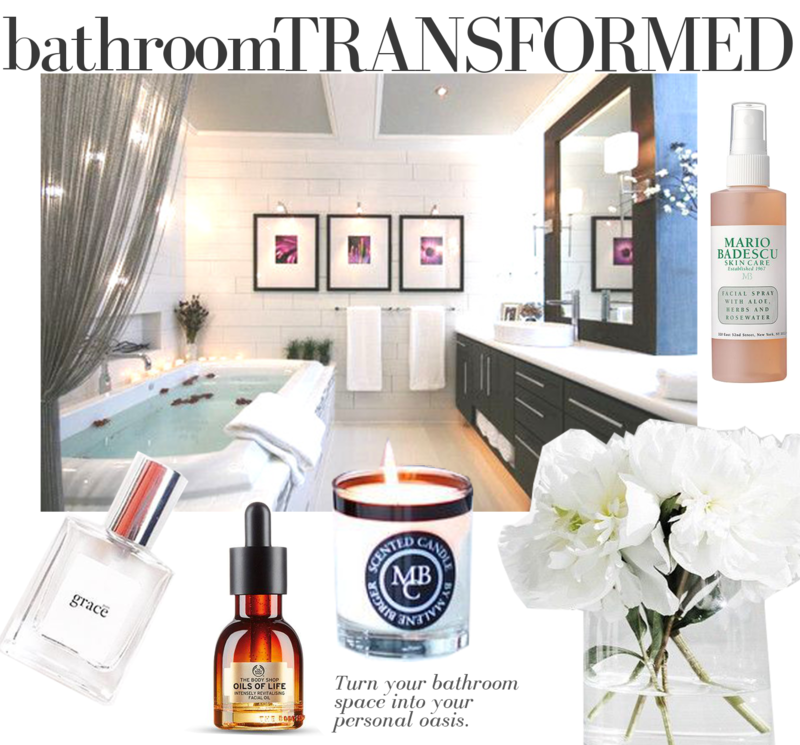 Since I want my bathroom to represent freshness, it is my intention to add elements that represent freshness. Cotton scented candles, fluffy towels, white accents, and fresh flowers immediately come to mind. For years, I've had white gardenia plant growing in the back yard but paid no attention to it. But now, I'll be snipping off the fresh blooms and showcasing them in my elevated bathroom. Sure, this takes just a bit more effort, but the rewards of having a room reminiscent of a spa day makes up for all the hard work. It's all about creating a space the truly inspires us. It may be years before I get the bathroom of my dreams, but at least I can still feel like it.